I find that more often than not, when I ask what I can bring to a dinner, the answer is salad. It seems this is often the course people would like for someone else to bring. Has that been your experience, too? Last week I was a big hit when I showed up to a friends house with this super yummy avocado salad. And guess what? You can resourcefully make a delicious homemade dressing at the same time! You can also reinvent this salad with oranges, blood oranges, or tangerines. Citrus fruits become better and better as we move closer to winter. 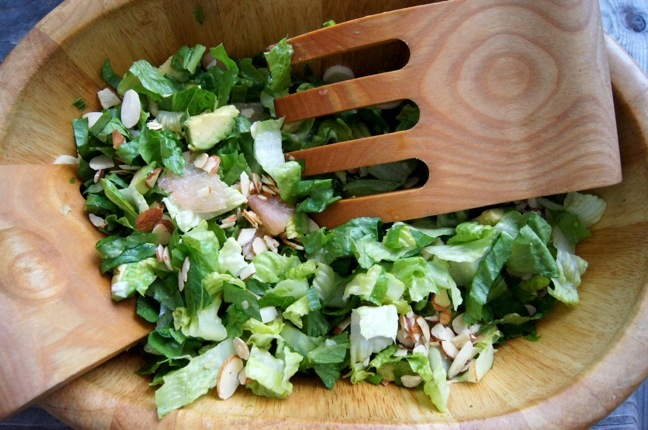 In a large mixing or serving bowl, combine the lettuce with the avocado and hearts of palm. Then cut the grapefruits into supremes (here’s how), and be sure to save all of the skins and insides! Add the supremes to the salad bowl and set aside. Squeeze all of the excess juice out of the grapefruit skins and membranes into a small mixing bowl. Add the mustard, honey and vinegar. Gradually whisk in the oil and season to taste with salt and pepper. 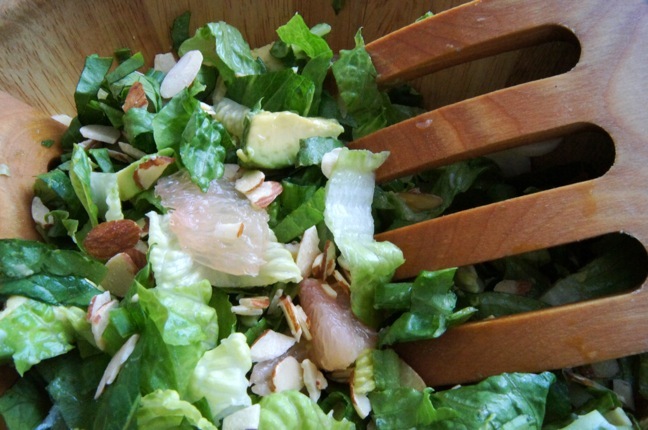 Just before you’re ready to serve, add the cheese, almonds and dressing to the salad.